Edge-Guard is a pre-glued, flexible plastic trim with a mylar cover. It gives a beautiful, finished appearance. Just push it on and it's done. 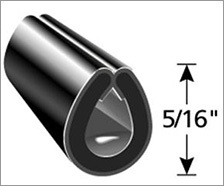 5/16" Edge Guard fits over edges up to 1/8" thick. Comes in chrome, gold and black.